Sweet blue Easter bunny face, with long ears. It is a really fun badge and ideal to pop in Easter baskets & use as an alternative Easter gift. Our badges are popular with kids and adults alike, we have lots of easter and Spring badges to pick from so be sure to take a look at our Easter badge category before checking out. 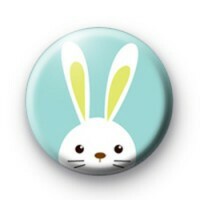 Although not as tasty as a chocolate egg but this Easter rabbit badge is a fun addition to Easter. All our badges are 1-inch in size and handmade in the UK by us (with love).